Particularly when running long distances, it’s important to distribute pressure and protect yourself from the twin dangers of shear and chafing. For all serious runners, the anatomically designed protective pads in Falke Ergonomic Cushioned Short Running Socks maximise direct shoe contact and improve stability. A left/right specific fit and targeted padding protects joints, toes, heels and the Achilles, absorbs shock and reduces pressure. 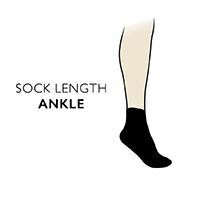 These short leg socks include a comfort top for hold without undue pressure on the ankle and cotton air channels to allow feet to breathe and move moisture.